These indoor 3x5Ft U.S. Army field flags are made of 100% nylon material and feature a printed design, pole hem and gold fringe for indoor display. 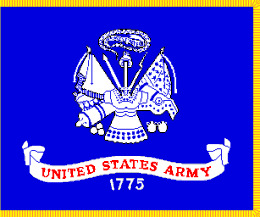 This field flag is identical in design to the Army Flag except that the main colors are reversed (ultramarine blue field, white insignia, yellow fringe (for indoor versions). The Army motto, "THIS WE'LL DEFEND," appears above the insignia. Below it is a red scroll inscribed with "UNITED STATES ARMY" in white lettering. The year of the Army's official birth, 1775, appears in blue numerals beneath the scroll.